it is our aim to offer all fishermen the opportunity to fish in an unpopulated fishery and enjoy and relish every moment in this tranquil and rural part of Norfolk. There are three lakes situated within the park. Our predator lake is 4.75 acres in size with depths of 8-10 feet supplied by natural springs with a bed covered silt bottom, It has large stock levels of fish ranging from catfish 120lbs plus and carp 35lbs plus. This is fishing at its very best. 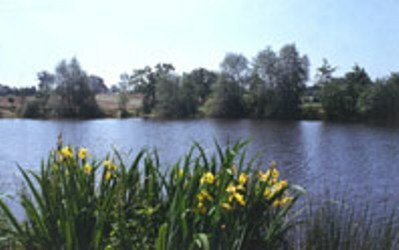 Our second lake is about an acre which offers course fishing and is situated amongst the oak trees. Lakemore fishery offers an angling experience which is ideal for beginners and specimen hunters alike. With five lakes on site we offer a varied range of angling from Specimen Carp and Catfish to general pleasure angling. Easily accessible from M6 Junction 17 yet set within idyllic and secure surroundings, Lakemore is without doubt one of the most beautiful waters you will fish at. Lakemore Fisheries was excavated between 1981-83, the lakes were then stocked with Carp, Roach and Rudd. Over the following year's Chub, Bream and Tench were also added, then 20 years ago 115 Catfish were acquired all approximately 4 inches long. 105 of these cats were stocked into the Horseshoe and 10 stocked into the willow pool. Five years later, 25 cats were moved into the long lake. The rest is history. Horseshoe Lake now boasts hundreds of lake bred Catfish with many of the originals now over 46lb. This is a similar story in the long lake, with all 25 cats stocked now all pushing 20 - 45lb and growing. The Carp in Horseshoe are generally in mint condition, and many landed have never been caught before. The Carp are now up to 32lb 10oz and in the long lake they are to about 27lb with several fish now pushing the 20lb barrier every year. The other three lakes being the willow pool, the golden lake and the moat, contain a wide range of general course fish with Carp to 20lb, Perch to 3.5lb, Bream to 6lb, Roach to 2lb, Rudd to 2lb, chub to 5lb, golden Tench to 2lb, Crucian Carp to 2lb and Ghost-koi Carp are present in the Horseshoe to 24lb. Day Tickets, Night Tickets and 24hr Tickets etc. Todber Manor Fisheries is set in the heart of the Dorset countryside? and is the home of some of the finest carp and coarse fishing in the South West. On-site there are 7 lakes including 3 specimen carp lakes, a runs water and 3 match/pleasure fishing lakes. The lakes are well known for there carp fishing but they also provide one of the few places in Dorset to catch a Catfish. The on-site tackle shop is one of the biggest in the U.K and stocks all major brands. To complement the lakes we also offer self catering holiday cottages and a 5 C/L site to provide the ultimate fishing holiday. Set within 25 acres of idyllic Worcestershire countryside only 3 miles away from Kidderminster, Shatterford Lakes is considered to be one of the UKs premier angling venues with six fishing lakes all interlinked by fresh natural spring water flowing from the hills into the valley below. The fishery itself provides perfect fishing conditions for beginners as well as a challenging but rewarding experience for angling enthusiasts who could potentially land catfish over 70lbs+, carp over 42lbs and an abundance of good sized silvers, including roach up to 3lb and bream over 10lbs. The Catfish Conservation Group's own syndicate water. Situated on the outskirts of Alcester, Warwickshire. Run as a CCG syndicate. Contact Ray Allsop Tel: for more information and costs.